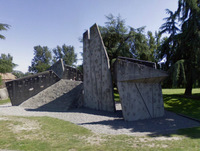 The University of Washington Practice Rock is a concrete structure with rocks set in for holds. 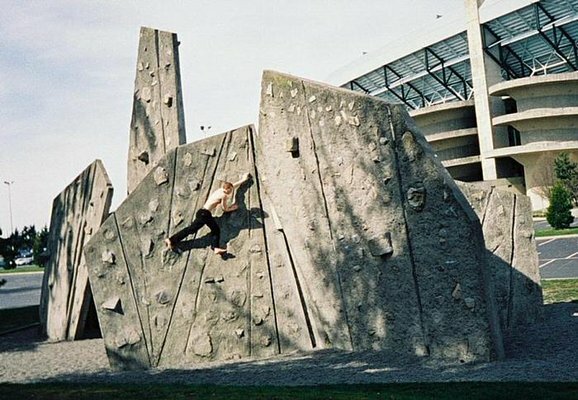 It was built in 1975 and is therefore the first open access bouldering facility know of. Technically it is in the grounds of the university and only open to students, graduates and university employees. That said, most of the people who climb here have never had any affiliation with the university. "It is one of the best artificial bouldering facilities anywhere. It is located at the southern edge of the parking lot between Husky Stadium and the Montlake Cut, on the University of Washington campus. Back in the late 70s and early 80s, this was the hub of Seattle climbing. The introduction of indoor climbing at the Vertical Club in 1987 diminished the rock's popularity, but it is still a fun place to hang out, and the best place in the state to practice crack climbing. It has some of the hardest boulder problems in Washington, although they are mostly contrived." Rules are posted; please abide them. Pumping Concrete - A guide to Seattle-area climbing walls. Contains a full list of boulder problems was published in 1996. It is now outdated and also out of print.